A photo taken with an iPhone by Abbie Archer. It shows one of the main chambers as a several tour groups pass through it. The phone rang as I was packing for my vacation. It was my dad calling to tell me that a major flash flood had ripped through Page, AZ and Antelope Canyon that afternoon. It was Friday, Aug. 2nd, 2013 and the next morning I was leaving for Page, AZ and Lake Powell. 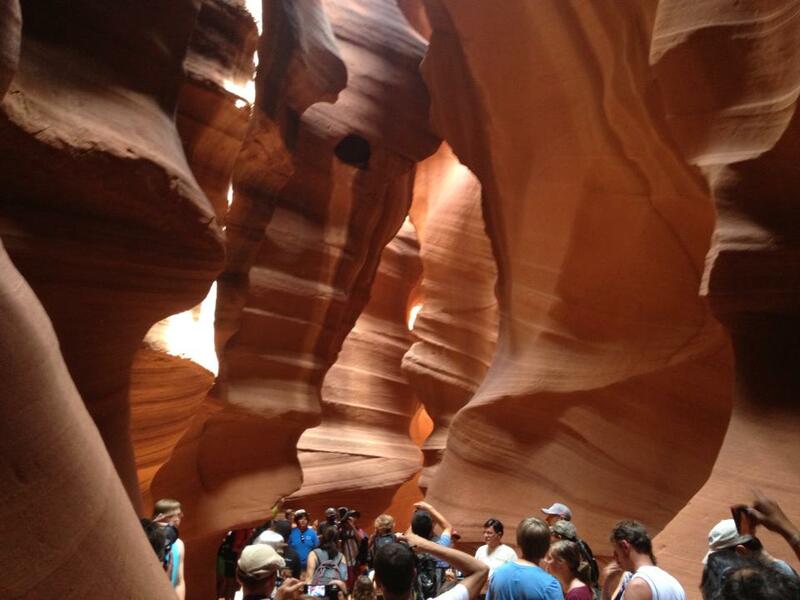 “Be sure to check the weather before you head into Antelope Canyon,” he warned. As I continued to fill my suitcase, I wondered if the weather would clear up by the time I arrived in Page. On Monday, Aug. 5th, I was scheduled for a photo tour of Upper Antelope Canyon. It was one of several tours I had booked in advance due to limited space and availability. 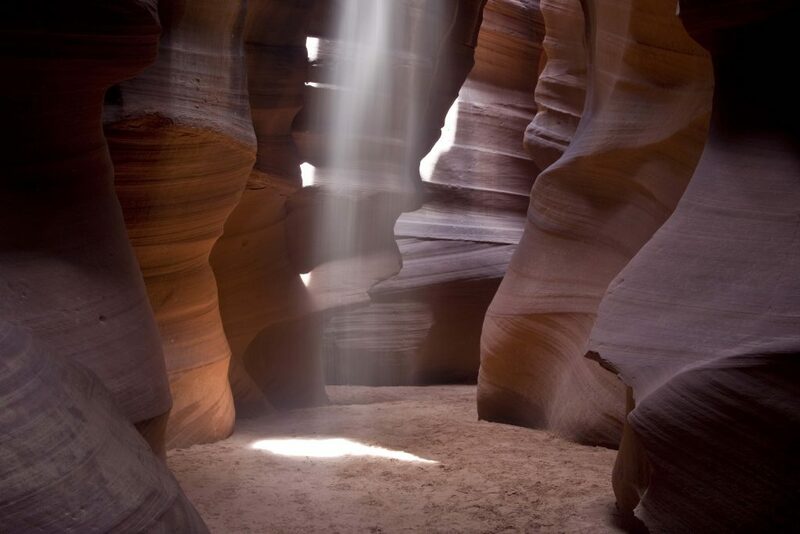 Located on Navajo land, Antelope Canyon is one of the most beautiful slot canyons in the American Southwest. Photographers from all over the world visit this canyon to capture images of the elusive light beams and mesmerizing colors and lines that shape its twisting sandstone walls. The canyon is divided into two sections, the Lower Antelope, and the Upper Antelope, called Tsé bighánílíní, “the place where water runs through rocks” by the Navajo. 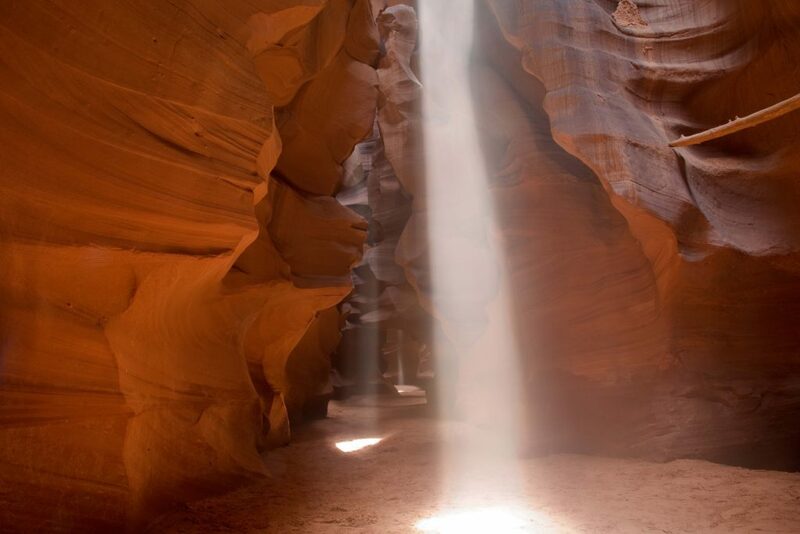 It is the most photographed and most visited slot canyon in the American Southwest according to Wikipedia. The walls of the canyon often look like they are glowing embers or on fire. The overcast sky delivered light rain the night before the tour. When I checked the weather on Monday morning there were no flash flood warnings and the tour was still on schedule for 10:15 am. The light beams typically appear around midday during the summer months so the 10:15 or 12:15 tours are the most popular. 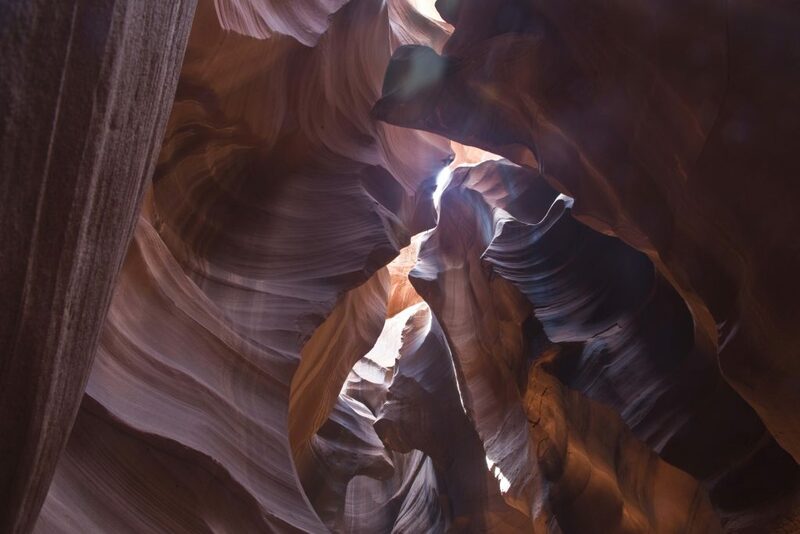 Most of the tour companies only offer the extended photo tours to photographers with a tripod and DSLR equipment, as the lighting in the slot canyon requires that you use a remote shutter release for best results. My tour was booked through Adventurous Antelope Canyon Photo Tours, who usually take only seven photographers into the canyon at a time. There were 11 photographers in my tour. Unfortunately another canyon was closed due to flooding, and the tour company had to move a few people into our group. Our guide’s name was Joshua. He loaded us into a tour truck and we were on our way to the canyon. The drive was short, but there was an abundant amount of sand whipping up at us en route. Most of the group had their equipment in a backpack, but a few scrambled to cover their cameras up. 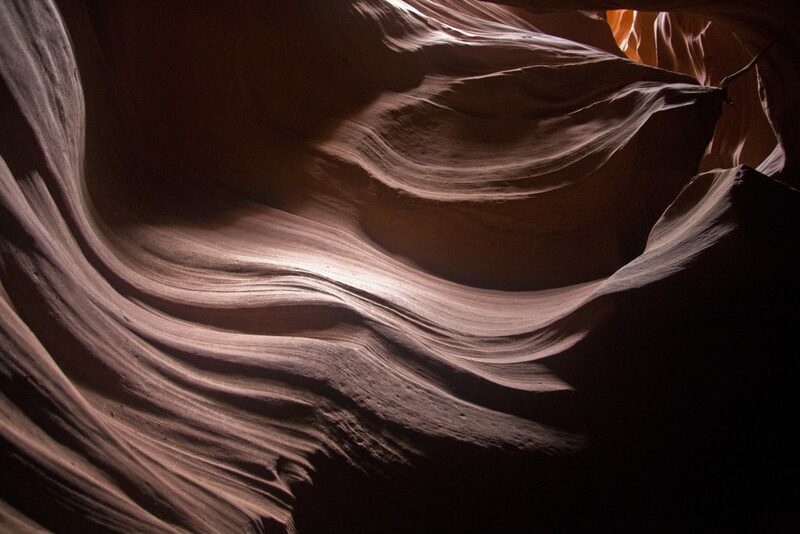 As we entered Upper Antelope Canyon I was awestruck by the natural beauty of the place. The colors and patterns were unique and amazing. It was hard to keep track of Joshua as he navigated through the crowded canyon. Some areas were so narrow we could only pass through in single file. He finally stopped and pointed up and said, “This is the Wall of Fire”. We were squeezed up against the sandstone wall as other groups passed by us. It was a challenge to set up our tripods and to get our cameras out of our packs. It took a few shots to adapt to the darkness of the canyon and the shooting environment but Joshua made sure we all had time in a good position to get the shots we wanted. A view looking up towards the top of the slot canyon. 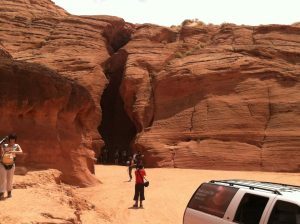 Our group continued to move through the canyon, stopping to set up shots at locations that our guide pointed out to us. After about an hour, there was chatter that a light beam had appeared in the first chamber. Joshua urged us to move quickly all the way to the front of the canyon. We were the second photo group to arrive, and we had to wait our turn to capture the beam. The guides held the other photo groups back for approximately 10 minutes. That didn’t leave much time to work with, and there were over 20 photographers trying to capture the light beam. The guides swiftly asked some of us to lower our tripods while the others standing behind them set up their shots. One of the guides threw fine white sand into the air above the beam, and it spilled down, slowly filling the beam with dust and becoming visible. Timing was of the essence. If you took the shot too quickly, the beam was not completely visible. As sand slowly dropped to the bottom, you had only seconds to capture the beam fully lit up. Then the beam was gone, as the last of the sand hit the ground. Several chambers had light beams, so we were able to get a lot of photo opportunities. Joshua always made sure everyone in the group rotated through the best positions for each location. The last shoot was the most difficult. Three chambers were back to back with light beams in each one. Three guides had to coordinate throwing sand at the same time and then jump out of the way. We were told we had three chances to get this shot, and then my iphone froze up. I had been using the wireless network in my Canon 6D to connect to the EOS Remote app in my iphone. The app allowed me to control the camera settings and shutter release remotely from my iphone. I restarted my iphone and began to reconnect as Joshua hastily helped me set up the shot. I didn’t see the other two beams in the background, so he rapidly repositioned my camera to capture the full scene. In the process he increased my exposure manually from 0 to 3, since my iphone was slow to restart. It brightened up the image, but blew out the beams. Once my connection was back online, I was glad to be able to take a few more pictures of the triple beams. Since I was shooting in RAW and JPG simultaneously, I had left my exposure on most shots at 0. In RAW I was able to go back and adjust the exposure as needed. Fortunately I took several shots without the beams and was able to merge two photos together to get a decent shot of the three beams lit up. After the triple beam photo shoot, we were all exhausted. Joshua said we had eight more minutes to shoot whatever we wanted. Most of us just took in the magical views of the slot canyon. We were so busy during the tour that we didn’t really get much time to simply enjoy what we were seeing. It was a fantastic experience and one of the highlights of my trip. One day I plan to go back to Page, AZ to photograph Lower Antelope Canyon, Canyon X and a few of the other canyons. I may even visit Upper Antelope Canyon again. It was that amazing! This beam looks like a wedding vail cascading to the floor of the chamber. Entrance to Upper Antelope Canyon. 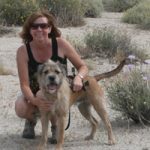 You will need a DSLR camera, a tripod and a remote shutter release for best results. If you want to use a tripod and capture the beams you really need to go on a special photo tour for photographers. It is longer and slightly more expensive, but well worth it. The Adventurous Antelope Canyon Photo Tours charge $86 per person and only allow photographers with proper equipment (DSLR, Tripod, etc.) on the photo tour. It is 2.5 hours long. The guide really helps you to set up the shots and gives you photo tips. A friend of mine, who was travelling with me, took the regular tour. It was 1.5 hours long and cost $46. Upper Antelope Canyon is about 100 yards long and is flat. It’s an easy walk. The tours are busy and there are usually quite a few people in the canyon at the same time. It is crowded! If you want to avoid the big crowds, go at early or later times when the light beams are not showing. The most popular tour times are 10:15 and 12:15. FLASH FLOODS: Always check the weather before you explore the beautiful desert slot canyons and flood zones. The tour companies are usually notified in advance of flash flood warnings. 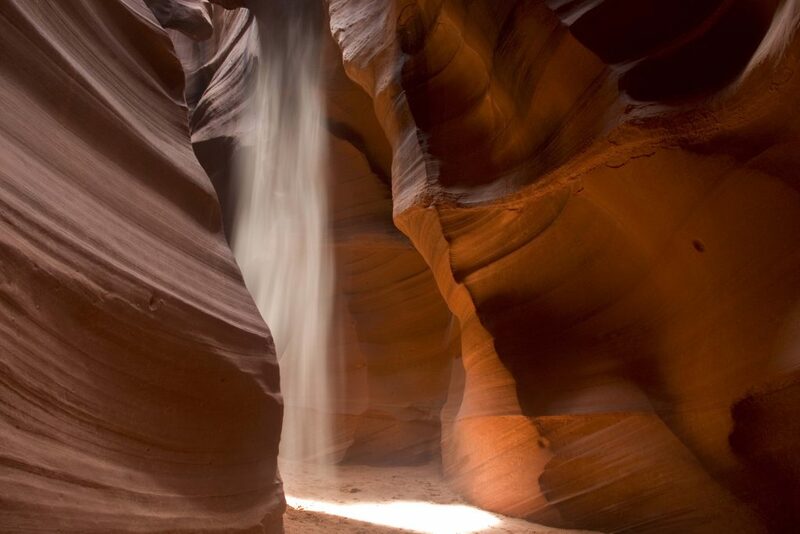 One of the guides said the most recent flash flood moved so much sand through Antelope Canyon that the floor of the canyon dropped 3 to 6 feet in some areas. 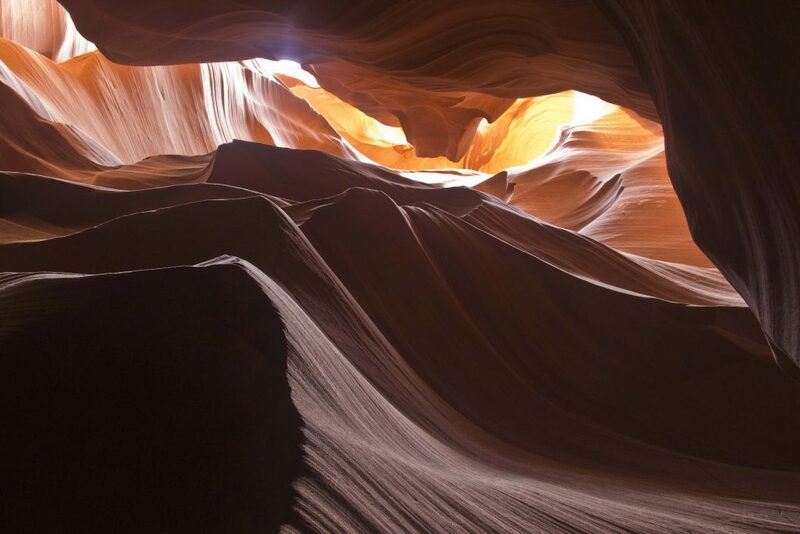 Below is video taken by a photographer who was in the area during the flash flood ripped through Antelope Canyon and Page, AZ a few days before my trip.